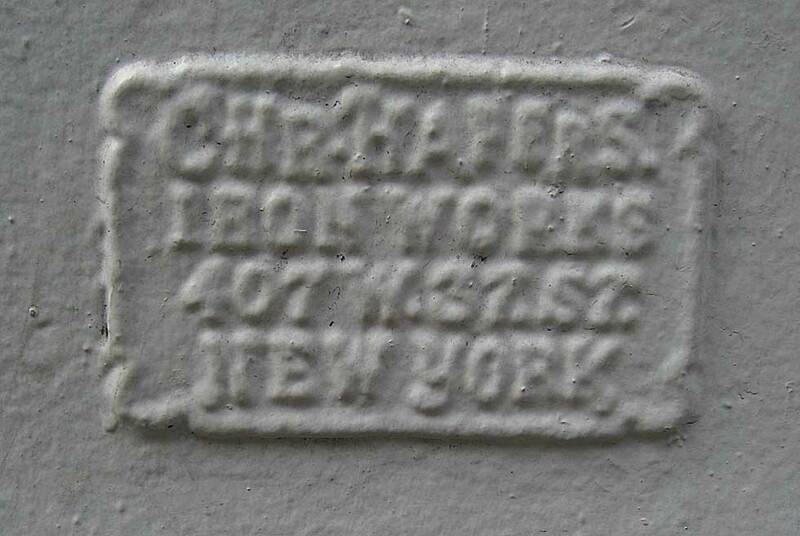 Christian Hafers Iron Works were located at 403-407 W. 37th St. near the corner of 9th Ave. from 1874 to 1946. Longevity indeed! Christian Hafers (1847-1927) was born 20 June 1847 in Bremen, Germany, and died 15 June 1927 in Brooklyn, NY. He appeared in the 1900 U. S. Census, age 52, born June 1847, Germany, living as a boarder at 120 W. 124th St., Manhattan. In 1908 he filed an application for a passport where he declared that he emigrated to the U. S. on the SS Rhine sailing from London, England, 10 August 1868, and that he became a naturalized citizen 15 August 1876. During the years 1874 to 1888 Christian Hafers was in partnership with Theodore Westing (1843/44-1907?) under the business name Westing & Hafers at 403-407 W. 37th St. Like Hafers, Theodore Westing was an immigrant from Germany. His naturalization petition dated 16 August 1878 gave his name as Diedrich A. W. T. Westing. Theodore Westing, age 37, appeared in the U. S. Census of 1880 living at 405 W. 37th St. with wife and six children. Westing began in business in New York in 1870, and moved to 403 W. 37th St. in 1872. This ad appeared in Trow's New York City Directory for 1872. In 1897 he filed a passport application stating that he was born 27 June 1843 in Oldenburg, Germany, and that he emigrated on the SS American from Bremen, July 1867. In the 1900 U. S. Census Westing's birth date is recorded as June 1844. The building at 318-330 Amsterdam Ave., northwest corner of 75th St., is a designated New York City Landmark. Constructed in 1890, it was occupied by the New-York Cab Company from 1890 to 1909. The architect was C. Abbott French & Co. The Landmarks Report LP-2209, dated 14 Nov. 2006, states that the builder has not been identified. The presence of the Hafers foundry mark on the facade indicates that Chr. Hafers contributed iron work to the construction. In 1913 Chr. Hafers Iron Works were awarded the contract for steel and iron work in a hotel building constructed at 403-405 W. 42nd St. on the corner of 9th Ave. This well-worn coal chute cover manufactured by Chr. Hafers is found on W. 49th St.